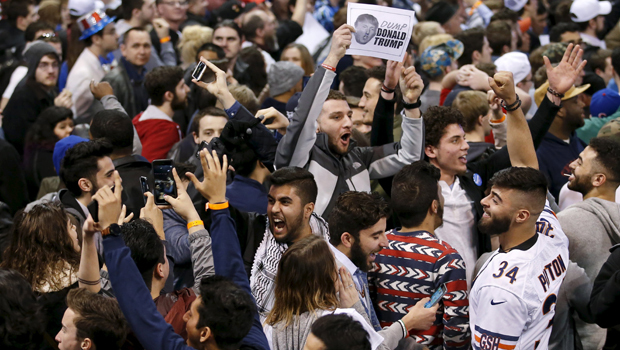 Trump protest organizer calls raucous night a "win"
CHICAGO -- When protests broke out at a Donald Trump rally in Chicago on Friday night, so too did "Bernie, Bernie" chants. Trump eventually canceled the rally at the University of Illinois at Chicago Pavilion, and many of the protesters responsible for that were Bernie Sanders supporters. One of the leaders of the protest was a Sanders surrogate, 20-year-old Ja'Mal D Green, who describes the night as a "win." "Our whole purpose was to shut it down," said Green, a Chicago-based entertainer and activist. "Trump tried to bring his rally to one of the most diverse universities, and we had to show him that our voice in civil rights was greater than his voice. The minority became the majority today." Green said that the planning for the protest began about a week ago, when they found out that there was going to be a Trump rally. Green was not alone in planning the event. He said there were many different people and groups collaborating on what to do and how to conduct the protest. There were many Facebook pages created to draw Trump opponents to the event. One of those pages, "Trump Rally Protest - Chicago," had 11,000 marked as attending and 19,000 marked as interested. That page tells people to buy tickets online and lays out the reasons for the rally. Green was supposed to be attending the Bernie Sanders rally just 10 miles away from the Trump rally, but when he found out that he was cut from of the program due to time constraints he went to the Trump rally instead. He did not inform the campaign that he was going and said that it had nothing to do with him protesting. At the protest, Green said the plan was for demonstrators to make noise when Trump walked onstage "and then rush the stage." Green said the thinking was that the police would not know who to grab because there would be so many people doing it. The protesters' main chants were: "We stopped Trump" and "Not in Chicago." Chicago protesters: "We stopped Trump"
When the rally was canceled, the plan to rush the stage was off, but not for Jedidiah Brown, another Sanders supporter. "I had my sight on the stage," he said. "I was set on it with gusto. When he did not come out, I was still going to put out my message that America is already great without hate." He charged the stage, ripped a Trump poster and was detained. He lost his glasses and said, "I will have to the blind for a while." Brown, a 29-year-old minister and activist, said that the Trump supporters were worse than he had imagined. "We kept hearing plans made in the crowd: 'I am going to punch the guy with the earring in the face if something happens.' They wanted that," he said. He was also impressed by how many protesters made it into the event. Before the event started, people kept coming up and whispering in his ear that they were there to protest. Brown has been a Sanders supporter for a while, but after the rally, he called the campaign Friday night to tell the campaign that he was all in and willing to help. "They loved it," he said. He is waiting to hear back from the campaign to see if it wants him to do anything. On Saturday morning, Green will be at a Sanders press conference, though there are no plans for him to speak. Later in the day, Brown will be on one of the campaign's roundtables on criminal justice. "Bernie has given me the hope and the faith that I was losing because Obama was leaving," Brown said. "He made me believe when I was giving up on American politics. I feel like Hillary Clinton is the Democratic version of Donald Trump. I feel the Bern only. If he is not the nominee, I will disrespect my elders because I doubt I vote."